Over the past few years, the Israeli communities on the border with Gaza have endured continual Kassam rocket attacks. These attacks are untargeted, but some have hit residences and schools, killing 11 citizens and hurting hundreds more. The city of Sderot, located on the border with Gaza, has been hardest hit — its children growing up in the shadow of violence, fear, and uncertainty. To directly impact the lives of the children of Sderot and provide them with the chance to simply be kids, Jewish National Fund has embarked on a massive project: building the largest indoor playground in Israel in Sderot. 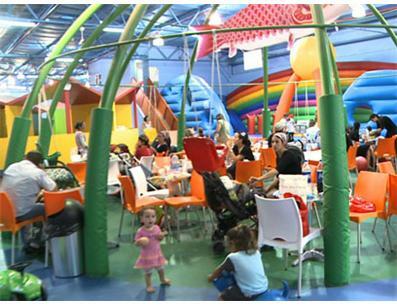 The all-inclusive Indoor Recreational Center opened on March 10, 2009 to provide Sderot’s youth with a place to have fun, connect with friends, enjoy stimulating classes, and be children, beyond the conflict. A place to feel strong and free, away from their daily helplessness and anxiety. And parents can have peace of mind knowing that their children are playing and learning in an environment that is safe and secure. In the Israeli town of Sderot, parents cannot send their children outside to play on a beautiful day. Soccer fields are no longer home to after-school games. There is no sound of laughter, cries, screeches, or any other usual childhood noise. The streets are not filled with children riding bicycles but rather with an eerie silence. As rockets launched from the nearby Gaza Strip fall on Sderot, life is at a standstill, especially for the town’s 3,000 children, who are forced to remain indoors all day rather than risk the chance that they won’t be able to reach a bomb shelter quickly enough during a rocket attack. The all-inclusive Indoor Recreational Center opened on March 10, 2009 to provide Sderot’s youth with a place to have fun, connect with friends, enjoy stimulating classes, and be children, beyond the conflict. A place to feel strong and free, away from their daily helplessness and anxiety. And parents can have peace of mind knowing that their children are playing and learning in an environment that is safe and secure. You can help! For your Mitzvah Project you can directly impact the lives of the children of Sderot and provide them with a safe place to play. Support is still needed to purchase new equipment and to keep the center going for all the kids of the region. Learn more or contact 888-JNF-0099 (888-563-0099) to get connected to your local JNF office.